Everyone at the Royal Academy for Perfect Princesses is excited about the pet show. Everyone except for Princess Peepers. She doesn’t have a pet! Will a bug from her collection work? What about a frog from the royal pond? Can the other princesses accept a pet that is as unique as Princess Peepers is? 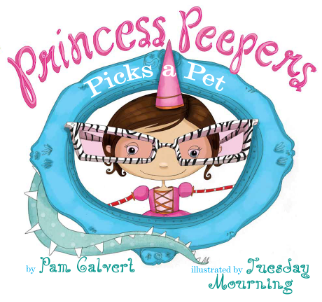 Princess Peepers makes this pet show an unforgettable one, in this sequel about the world’s most loveable, offbeat princess. Kirkus Reviews--" Peepers' quirks reveal a sympathetic character; her internal musings and wistful dialogue demonstrate her longing for acceptance...It's a light regal romp, forgoing the need for any extra pomp or circumstance." Children's Literature-- "Given how syrupy Princess tales can be, Princess Peepers is treat...The language in the tale is lively and Tuesday Mourning's bright graphic digital collage illustrations fit this perfectly perky princess." The Bewitched Librarian-- "For little girls clamouring for all things princess, this book has a fun spin on traditional princesses. The cartoon illustrations are charming and worth flipping through themselves." The Horn Book Guide to Children's and Young Adult Books-- "Peepers is irreverent enough to please tomboys but princess-y enough for the princess-obsessed." Fourth overall in top ten children's/YA bestseller's list for Indie bookstores throughout St. Louis! Nevada Young Readers Recommended Reading List!